The Caramba Theatre Company was born in July 2002. 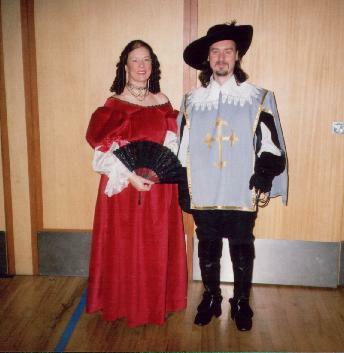 We didn`t have a name at the beginning but we had an idea which was the result of Kate`s ambition to costume Macbeth in kilts and Tim`s desire to play the title role. Tim and Kate got together during a production of Twelfth Night. Tim played Feste and on the last night Kate (who did costumes) bet that he wouldn`t shout "Ay caramba" during his gabbled Spanish speech (disguised as Sir Topas) to Malvolio. Of course he did. So Caramba became our name. Caramba Theatre Company are based in Stratford-upon-Avon. We rehearse and perform there at present. We are an amateur, non-profit making company and the members come from all over the Midlands and any profits from shows, we donate to a charity once a year. We are privileged to have among our patrons;Michael Boyd (the Artistic Director of the Royal Shakespeare Company); David Bradley ( Most recently known as Filch in the Harry Potter films) Simon Trinder ( RSC actor), David Troughton (RSC associate actor) and Stratford Playwrights` Reg Mitchell OBE. We produce 1-2 shows a year at present, usually in March/April and a show November/December near Christmas. Probably because Kate`s professional background is in designing and making costumes, we tend to produce costume pieces more than anything else. We work hard on shows but hope that working with us is fun and we aim to make everyone as welcome as possible. You would be very welcome to join us! You don`t have to act. We welcome anyone who wants to be involved backstage, directing, front-of-house, even prompting or serving the wine! Tim was born and brought up in Stratford. After school, he completes a 2-year BTEC National Diploma in Performing Arts at Stratford College. He went on to complete a BA(Hons) degree in Acting following training at Bretton Hall College (Leeds University). He returned to Stratford and has worked for several local companies. For Caramba, he directed and played the title role in Macbeth; played Jack Worthing in The Importance of Being Earnest; Ariel in The Tempest; he directed and played Athos in The Three Musketeers at Christmas 2004. He directed Loot in May and he was seen recently in the starring role of The Noble Spaniard (Somerset Maugham) at the Priory Theatre in Kenilworth in June 2005. He played Mr Wickham in Caramba`s very successful adaptation of Jane Austen`s Pride and Prejudice in November 2005 and as Mercutio in their outdoor production of Romeo and Juliet at Halls Croft summer 2006. He appeared as the "villain" in Fatal Encounter at The Priory September 2006 and had his first role opposite his wife in The Taming of the Shrew in February 2007. He appeared as Puck in Caramba`s A Midsummer Night's Dream in July 2007 and played Laurie in the Priory Theatre's Little Women in September 2007. He appeared as the "Ideal Husband" in Second Thoughts production in November 2007 in Stratford. 2008 and Tim directed Stratford Gilbert & Sullivan`s Society`s HMS Pinafore, at the end of March 2008. This was one of their most successful shows in recent years. He also played Jesus in Caramba`s return tour of a passion play Resurrection - tour of local churches. His previous roles have included young Walt Whitman in Ancient Pinnacles and Jack Rock in The Big K, both for The Bird of Prey theatre company. For Falcon Productions, he has played Puck (Midsummer Night's Dream), and Feste(Twelfth Night). For Wilson Roberts Productions, he played the lead in Beetleheart and Fred in A Christmas Carol. One of his favourite roles is Richard III which he has played twice (once at the Edinburgh Fringe). He has played Prospero in The Tempest (Wakefield Theatre Royal); Charles Surface in The School for Scandal (Talisman Theatre). His directing credits include Heads by Howard Brenton, Glen Garry, Glen Ross by David Mamet. Films include; a sales rep in Anorak of Fire (BBC Screen Two);Video - Mr Safe / Mr Sorry in Safe or Sorry (Working Pictures); Parson Dance in The Widow Ranter (rehearsed reading for the RSC). Kate has spent about 25 years designing and making costumes in professional and amateur theatre. She originally completed a 2 year drama course at Stratford College and went on to complete a City & Guilds Certificate in Pattern Cutting & Design. She has also completed several courses in costume cutting, hat making and wig making. A great deal of her expertise was learned "on the job". Acting roles have included Ariel (The Tempest); title role in Oedipus; third witch in Macbeth, a clock(!) and the villainous Milady De Winter in Caramba`s The Three Musketeers. Her professional theatre career in costume has included work for The Mill at SonningTheatre, Reading; The Redgrave Theatre, Farnham (now sadly closed); The Thorndyke Theatre, Leatherhead; Salisbury Playhouse; The Young Vic; RSC; Ken Brannagh and David Parfitt`s Renaissance Theatre Company and the Anjali Dance Company for people with learning difficulties. Kate also worked at L.A.M.D.A. where she was involved in costuming student productions and teaching students costume construction. One of her claims to fame was that while here, she worked with Laurence Olivier`s daughter and met the man himself! Kate`s local work includes costuming Becket (Millenium Productions); A Christmas Carol, A Midsummer Night`s Dream, Twelfth Night, Elves;The Musical, The Quiney Affair (All Falcon Productions); Toad of Toad Hall at the Swan Theatre. She was also the Wardrobe Supervisor at the Stratford Gilbert & Sullivan Society for 3 years. For Caramba Kate has directed and designed and made costumes for The Importance of Being Earnest and The Tempest. She designed and made costumes for The Three Musketeers and played the evil Milady de Winter. She directed The Merry Wives of Windsor, an outdoor production, at Hall`s Croft in Stratford for Falcon Productions summer 2005 and adapted and directed Caramba`s highly successful version of Pride and Prejudice November 2005. She recently directed the company`s Romeo and Juliet and played Lady Capulet and she directed a Francis Durbridge thriller Fatal Encounter at the Priory Theatre in Kenilworth in September 2006. She appeared opposite her husband for the first time this year in her biggest role for Caramba as Kate in Taming of the Shrew. She has written and directed Caramba`s popular Passion Play in 2008/2009 & 2010, Resurrection, a mini tour of local churches. In 2012, Caramba was privileged to perform Coriolanus as part of the RSC's Open Stages collaboration with local amateur groups. It is thought that this Shakespeare play has never been performed in Stratford by an amateur group before. It was directed by Tony Boyd-Williams. This year is also Caramba's tenth anniversay.